Are You Hiring The Right Person? If you want to dramatically improve your hiring success rate, then you need to be doing employee hiring assessments. Companies waste thousands of dollars every year because they are hiring the wrong people. Why the Problem? After all, the applicant had a great resume, and a compelling round of interviews, but still turned out to be a low performer. The Reason is Simple. People can go to classes or seminars, read books or get coaching so that they can write great resumes and give outstanding interviews. If you hired based on the resume and interviews, you hired someone that is good at writing resumes and doing interviews, but not necessarily qualified to do the job! The truth is; good interviews have NOTHING to do with how well the candidate fits the position. 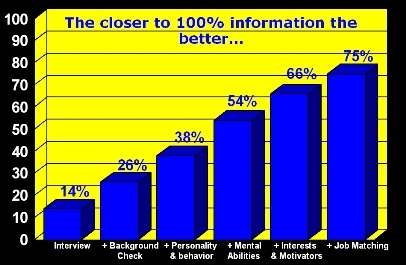 In fact, only 15% of applicants hired based on interviews alone end up being superior performers. By using our pre-employment assessment systems, you can more than quadruple your hiring success rate! Improve employee productivity, reduce turnover and increase your company profits, Contact Us or call us at 952-322-3330 to find out how our employee hiring assessment systems can work for you. For more information on how you can dramatically increase your hiring success rate, Contact us or call us at 952-322-3330 to find out more about pre-employment assessments.